Even though the requirements for the street address on the label are pretty clear cut, it still seems to be an issue for those working out of their homes. The street address IS required on the product label, but may be omitted under certain circumstances (the city, state and zip code are always required). The regulations that define those “certain circumstances” are different for cosmetics and other products (including soap when it is exempt from the definition of a cosmetic). Note that a PO Box does NOT ever qualify as a street address. The FDA regulations still say the street address may be omitted if it is included in a “city or phone directory”. In their 2015 response to the HSCG’s petition to allow a PO box, they clarified that it may not be a PO box, but did say that it could be an online or print directory and gave some examples. See my blog post FDA Responds to HSCG PO Box Petition for more details. For products that are not cosmetics (including soap that is exempt from the definition of a cosmetic), the FTC regulations apply. 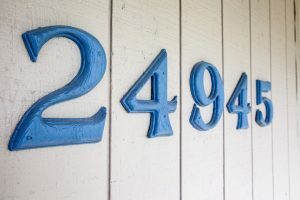 The FTC recently updated their regulations defining what standards must be met in order to omit the street address from the label. Basically, the address must be published in a readily accessible, widely published, and publicly available resource, which most likely includes a publicly accessible website or an online database (such as a state business listing). Use the street address on the label. List your business in an online phone or city directory (including the street address in the listing) and then omit the street address on the label. This meets the requirements for both cosmetic and non-cosmetic products. List your street address on your “readily-findable, publicly accessible” website, and omit the street address from your label. This meets the requirements for non-cosmetic products. This does NOT meet the requirements for cosmetic products. However, if you do this and it comes to the FDA’s attention, you have the potential justification and explanation that the regulations from the FTC were likely vetted by their attorney and do comply with the Fair Packaging and Labeling Act. You will need to decide what is the best course of action for your business and your situation. Do you think listing my address on an Etsy or FaceBook page qualify as “readily-findable, publicly accessible”? I dont’ know exactly what the standards are … but my guess is that “readily-findable” would be that it comes up in a search at Google and is high enough on the list that someone would see it (first page, maybe?). I honestly don’t know how Google does with indexing Facebook or Etsy pages, so I can’t comment for sure. If a business card with the street address is always included with every purchase, does this qualify as meeting the requirement for both cosmetic and noncosmetic? The intention of the regulations is to make it possible for the consumer to make “value comparisons” when shopping. They are supposed to be able to see the information when shopping, before purchasing. So technically just putting a business card in with the purchase wouldn’t be sufficient. the only possible exception would be if you are selling in person, at a craft show for example, where the information is posted and visible, you’re selling unpackaged soap and then you include the card with the purchase. I am importing my sisters salve. Would using her street address in the foreign country work? If you are in the US, then the imported product needs to be labeled correctly for import (otherwise it won’t be accepted into the country). The label must have the manufacturer’s or distributors address – even if it is in a foreign country. If you are outside the US, you’ll need to follow the regulations for the importing country. Also, I noticed that the Aya balm site has claims on it that would make the salve an unapproved drug in the US (and probably most other countries). You might want to rethink that. Thank you, yes, I have told my sister she has to take all the claims off. I am building a separate site in the US, but have told her those claims cannot be made on any website anywhere. She should be fixing now. I have purchased your book and am going through it, but am still not clear of what ‘labeled correctly for import’ means. I am assuming if we put her company name and address (street, town, country, zip) on the back label we will be okay. Even though it is a 0.6oz tin. Outside of street address being listed on soap labels what are all of the other information that needs to be listed on your label, and are candle requirements the same? What the product IS (the identity) and the net contents are required on all packages (soap, cosmetics, candles, food, drugs, toilet papers, etc) on the front of the package and the name and address somewhere (usually the back or sides). Ingredients are required on cosmetics, food and drugs. Candles may require the “burn time” (although I think that depends on the state). Some products require warning labels. What products require warning labels? Thanks for your help. From the FDA: Anything with untested, possibly unsafe ingredients, bubble bath, feminine hygiene products, tanning products without sunscreen and aerosol prodocuts. From the Consumer Product Safety Act: Hazardous materials (for cosmetics, the only hazardous materials I’ve found that might be applicable is more than 2% bergamot essential oil, orris root, or sprays or perfums that have an alcohol base and could be flammable). There are also some requirements for warnings for non-cosmetic products for children (toys, etc), which might apply to toys embedded into soap for childrens products. I am planning to place my soap items on the market and some will have cosmetic claims. In some of the soaps I would like to use natural colorants from plants and also use mica’s. I’m confused as to the definition of “approved” and “certified” mentioned in your book on page 144-145. Am I correct in that the terms “approved” and “certified” are the same thing? But then looking at the page 147-148, certain additives are exempt…. “those colors which are exempt from certification must be approved as color additives” has me going in circles!! LOL Bottom line, is the chart on 147-8 “approved” to use as color additives when applied correctly with the “uses and restrictions” listed in the chart ONLY under a “soap” label and not a “cosmetic” label? THANK YOU!! p.s. LOVE your Labeling book! It could save everyone a lot of trouble in the long run!! Thanks for going to the tedious undertaking of compiling it and breaking down the “lawyer-ease” for us! A “certified” color is one that the FDA has to check before it can be sold. They test for purity and then “certify” that the batch is good. That’s done at a manufacturer level. An “approved” color additive is one that the FDA has approved for use in particular types of products. There are some color additives approved for food, some for cosmetics, some for drugs. An approved drug could be a certified color (usually those are FD&C dyes) or a more natural color additive, like titanium dioxide or alkanet root. Soapmakers tend to use all sorts of things to get color into their soap. BUT, if the soap is a cosmetic, then the materials used to COLOR the soap must be those that are approved by the FDA for use in cosmetics (and sometimes there are limitations on how the color can be used). Granted, the FDA is unlikely to target you if you are using sage to make a beauatiful green soap … but they COULD, because sage isn’t an approved color additive. And if you got on their radar for that or some other reason, it could certainly be an issue. For the address, can I use a UPS mailbox, which is a physical address and not a P.O. Box? I would not be making any cosmetics claims about the soap. No – No UPS box, even if you use the street address of the UPS store. The “business address” is the place where the actual business decisions take place or the product is actually manufactured — which doesn’t happen in a UPS store or little mailbox. If it’s just soap, exempt from the definition of a cosmetic, you may omit the street address from the label the business is listed in an readily accessible, publicly available database, directory or website, and the street address is included. Most business names are registered with the Secretary of State or the Division of Corporations (or whatever it is called in yur state) and the physical address is part of the listing … so that should work. For my soap, can I put just the address on the back label with my ingredients? Yes – the address should go on the back (or sides or bottom). On the back with your ingredients in the typical way of doing it.